Bucilla Felt Christmas Stocking, Ornaments, and Tree Skirt Kits! We're continuing to add new kits to our Seasonal & Holiday Kits section. You'll find a nice selection of Felt Applique Kits from Bucilla, including felt Christmas stocking kits, ornaments kits, and tree skirt kits. These kits include all the materials you need to complete the felt applique project, including stamped felts, cotton floss, sequins, beads, needles, and instructions. The Sugar Plum Fairy felt Christmas tree skirt features a beautiful dancing ballerina fairy surrounded by candy canes, gingerbread, cupcakes, and other sweet treats. Add a magical touch to your Christmas tree this year with a creative felt applique tree skirt kit! The Sugar Plum Fairy felt stocking will become a treasured keepsake for your child or grandchild. I made a Bucilla Santa Bear Stocking for my daughter's first Christmas and she's still using her felt stocking 21 years later! These felt stocking kits provide lasting value thoughout the years. If you're like me, you like to add to your Christmas tree ornaments collection every holiday season. Bucilla felt ornaments kits make it so easy to add a variety of new and colorful handmade ornaments to your Christmas tree. They can also be used to top holiday gift packages for family and friends. The Sugar Plum Fairy felt ornaments kit includes a set of 6 sweet treat themed ornaments, including a cupcake, peppermint candy, lollipop, gingerbread, and two pieces of ribbon candy. Felt applique is a fun and creative craft for everyone. Kits make it so easy for beginners, and so convenient for experienced crafters, to create handmade holiday keepsakes to be enjoyed every season! Make sure to see all of our Felt Christmas Kits, including Santa Bear, Snowflake Snowman, designs by Mary Engelbreit, and more! If you enjoy punch needle embroidery, you'll want to see our Holiday Punch Needle Kits from Rachel's of Greenfield. These kits include foundation fabric, iron-on transfer pattern, DMC cotton embroidery floss, and illustrated instructions. You'll need a punch tool and an embroidery hoop to complete your punchneedle craft project. If you're a beginner and need some guidance in tool selection, please refer to the following Weekend Kits Blog post for Tips on Selecting a Punch Tool and Embroidery Hoop. Your finished punch needle art would look great matted and framed for home decor. It would also be a thoughtul handmade holiday gift to give to a friend. Let us know what you think of our products and services. We value your feedback and will use your comments to make improvements to better serve you. Visit Weekend Kits to explore a variety of creative craft kits and get ready to create a lasting keepsake for the holidays on your next Weekend at Home! Easy Baby Quilt Kits & Our New Look! Just in this week, we have 2 new Baby Quilt Kits from Fabric Editons LLC to share with you. They're part of the Quick Quilts line of easy quilt kits. They're ideal quilt kits for beginners because they feature simple quilt patterns and complete instructions. They're also a fun weekend quilting project for experienced quilters to make a quick and cuddly quilt for baby. These baby quilt kits include 8 coordinating 100% cotton fabrics, enough for the quilt top, backing, and binding. Baby will enjoy the textured chenille and soft flannel fabrics used in these quilts. You'll enjoy the simple designs and modern color choices. 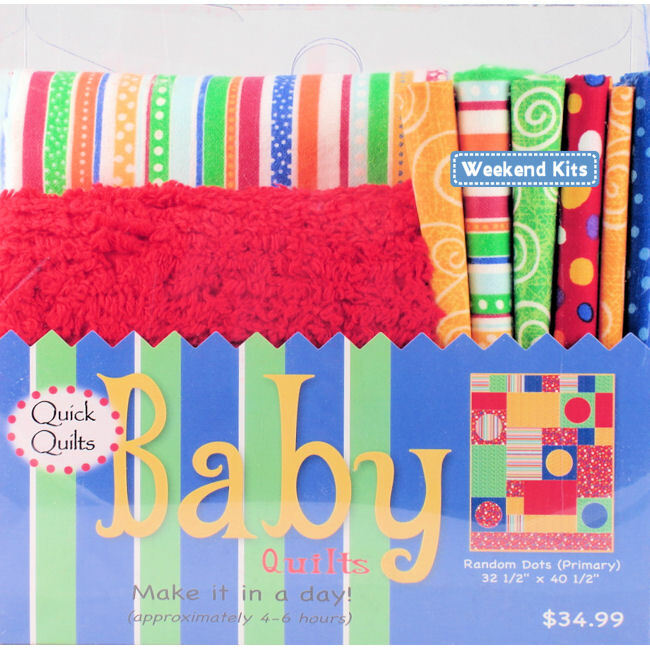 You'll find these baby quilt kits, along with our complete selection of easy quilt kits, in the Quilt Kits section of the store. This quilt uses primary colors and a "Random Dots" pattern to create a vibrant and fun quilt for baby. The finished size of this quilt is 32-1/2" x 40-1/2". Brighten up baby's day with this sunny quilt! This quilt features a "4-Patch" pattern in modern shades of lavender and lime green. Make sure to click on the image to see the pretty fabric patterns up close. This soft and sweet quilt is sure to delight baby and parents! If you need general quilting supplies to complete your quilt project, you'll find them in the Quilting Supplies section of the store. You'll find an assortment of essential quilting notions to choose from, including YLI Quilting Thread and Dritz Quilting Pins. We also carry Warm & Natural Batting in craft and baby sizes. Browse our selection of quilting supplies to make sure you have everything you need to complete your quilt project. Quilting and binding can present many challenges to the beginner, and even experienced, quilter. I came across the Sew, Mama, Sew! Blog and found a recent post that includes a nice list of Quilting & Binding Resource Links to help answer your questions in both of these areas. There are links to articles that offer binding tips & tutorials and show the different ways to bind your quilt. There are also links to helpful articles on machine quilting basics. You'll want to keep this list bookmarked as a ready reference! Make sure to visit Weekend Kits to see our new look! We have a new logo design and new colors. Let us know what you think. We're continuing to add new products to the store every week. Be sure to explore all of the Craft Kit Categories at Weekend Kits and get ready to start a new project on your next Weekend at Home! New Chatterbox Mini Scrapbook Album Kits! We have 3 new Mini Scrapbook Kits in the Scrapbook Kits section of the store. These Mini Album Kits include chipboard covers with special accents, double-sided patterned cardstock pages, coordinating binding rings, ribbon pieces, and chipboard accents with foil engravings. Mini albums are so easy to create! You'll find that mini size scrapbooks work well with wallet size photos or you can simply cut out sections from larger photos to custom fit the pages. When you have your photos ready to go, you use your favorite scrapbook adhesive to adhere them to the pages. After your photos are in place, you can have fun decorating your pages with creative embellishments, including chipboard accents, adhesive gems, stickers, and ribbon. Have fun and apply your own sense of style when designing the pages in your album. Sometimes it's helpful to look at examples to get layout ideas, but there's really no right or wrong way - it's whatever appeals to you! To personalize your album, it's nice to add some journaling to your pages and it's so easy to do. Select an acid-free pen, designed for scrapbooking, and simply start adding names, simple phrases, and dates near the photos on your pages. Mini albums are a fun way to share photos of friends, family, and special occasions. They also make wonderful gifts! We also have 2 new Scrapbook To Go Album Kits from K&Company to share with you. These kits include an 8.5" x 8.5" album, page protectors, designer pages, and a nice assortment of embellishments for decorating your pages. They also include an easy-to-follow instruction sheet for beginners. All you need to get started are photos and a scrapbooking adhesive. These Complete Scrapbook Kits make it easy to create a beautiful album in no time at all. They're great for beginners and ideal for anyone wanting to create a quick & easy scrapbook album for baby! Make sure to visit the Scrapbook Kits category for all the details on these kits and more. If you need adhesive, scissors, or pens, you'll find them in the Paper Craft Supplies section. Kits make it easy for beginners to learn a new craft. You'll find a variety of Creative Project Kit categories to explore at Weekend Kits. Visit today and get ready to create something new on your next Weekend at Home!